For some of our members, it’s the start of a new fiscal year which means business planning and annual budgets. Our manufacturers are planning for 40% annual growth!! This planning means renewing contracts and ensuring the sourcing of quality raw ingredients. 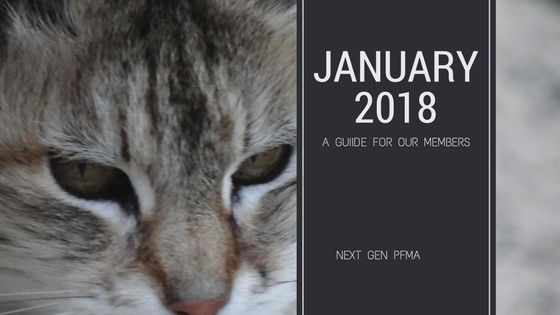 For Next Gen PFMA, it means another AAFCO meeting. This meeting promises to be exciting with discussions ranging from “minor” edits to the definition of human- grade food to the formation of a working group to discuss terminology of “villain” pet food ingredients. For the FDA, January 2018 means government shutdown and a totally inability to be present at AAFCO. The DFM Workgroup (direct fed microbial) will be unable to meet, again. UPDATE: The day after this article was posted, the government budget was approved and the FDA made their way to AAFCO. Still, on a larger, more important scale, it is unlikely AAFCO will make any definitive decisions. This could go in our favor – allowing AAFCO regulators to fully think about all sides of issues. We will be sure to make our voices heard at the meeting, but also as the year progresses. REMEMBER: Should you get a call regarding presumptive presence of pathogens in your food – NGPFMA is here to guide you through the process and ensure that your company only issues a recall if it is truly appropriate. I am hoping your regulatory phone stays quiet, while the consumer demand phone line ring off the hook. Here’s to an amazing 2018. Next WE DID NOT LOSE! !